W. S. Anderson directing . survival horror game to meet fan's needs. October 2 , 2012 - The long awaited Resident Evil 6 is now in stores. 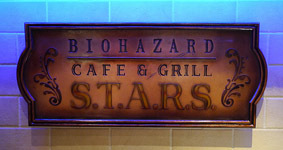 July 13,2012 - The Resident Evil Restaurant Opens in Japan. MOVIES In 2002 Resident Evil made the Jump from Video game to the Big Screen and has since had 4 sequels with a 5th on the way! BOOKS S.D. Perry has written novelizations of the first 5 resident evil games as well as 2 all original novels. COMICS In 1998, Wildstorm started producing Resident Evil: The Official Comic Magazine. TOYS Everything from action figures to specialty Items.